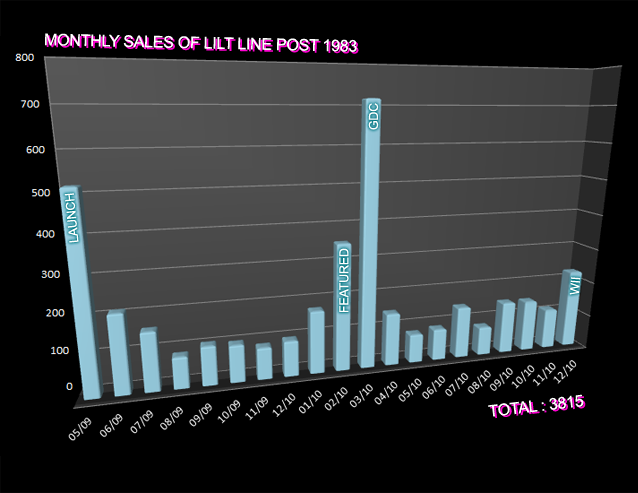 in this post i’m going to reveal all the sales figures for lilt line iphone since the dawn of time – which was around 1983 i believe. before i do that though i’d like to point out that i love lilt line & am very happy i made it. this will not turn out to be a whining post about how piracy is ruining the industry, the world owes me more money, gamers are not discerning enough & all pensioners are sluts or anything like that. i threw that pensioner reference in at the end to check you were still paying attention. lilt line’s price has remained pretty steady at £1.79 / $2.99. you can probably work out by yourself that i am not a millionaire. yet. all very interesting, and a lovely reagan-era bar chart, you might be thinking, but what is the point of this ramble? well, gaijin games, fully (or at least partially – sorry guys!) aware of the iphone sales, were determined to bring the game to the wii anyway. they knew it might well struggle to make money (or at least sort of knew – sorry again guys!). but they made it anyway, because they love the game. and i love them for that. how many companies do you know that would do something like that? don’t you think they deserve just a little bit of payback? if memory serves i also get a slice of the pie, but that’s incidental and nothing to do with the general thrust of this noble, principled blog post. so far the wii version has sold 3,756 copies in the us. if we don’t get past a threshold around twice that in america nintendo will never pay us anything. the eu store has a similar threshold. * disclaimer: numbers might not be 100% accurate. i had to appoximate based on income as i don’t keep formal records. or indeed informal ones. also this is the first time i’ve ever approximated based on income. in fact i’m not even sure what that means. I loved lilt line so it’s pretty sad to see this. However I think you do have an opportunity to make this a success if you reach out to the right people. I showed people the original iOS version when I was at the Bangface weekender festival and convinced 4 of my friends to get it who didn’t even know it existed. The sound track alone really appeals to Dubstep fans (and there’s definitely a lot of them in the UK!). Good luck, I hope it doesn’t deter you from making more games in the future. thank-you for the tips kaif, i should do a bit more dubstep specific promo stuff you are right. & don’t worry, nothing ever deters me from making games! I’m from Europe and I haven’t really looked into the game before I read these news on gaming sites and I’m wondering about one thing now. If I get the game on Wiiware (even in case I don’t like it, but out of some left over kindness), what happens if the sales barrier won’t be met over here either? Honestly I’d rather send you double the money directly than buy the game and end up just giving Nintendo free money off your work. P.S. : Would a steam release of the game make sense? Is one in the cards already maybe? @gLitterbug: if we don’t break the sales barrier we don’t get a penny, it’s okay though no need to send me any money! just buy the game if you like the look of it i would suggest. steam makes no sense really if you consider that the controls are motion based. Love the look of this game, and I love Gaijin’s work, so I would like to support them as a publisher as well. It doesn’t look like I will even get the opportunity to buy this though as I can find no information on a release date for WiiWare in Australia and I don’t own an i anything. I am disappointment. @Rob i am equally disappointment, don’t think we are coming to australia – sorry! Thanks for sharing some real data Gordon, hang in there it might pick up! Eurogamer.net just gave you a good review in their downloadable game roundup and it will be interesting to see if that boosts your sales on either platform – hopefully you can update in a month or so with new data. If you want to get good detail on your iOS sales try http://www.appannie.com (it’s free, and I’m not affiliated with them – just a happy user) – it gives a much easier to use interface to your sales than iTunes Connect does.